Since opening in June, Daily Table has welcomed volunteers from a variety of places and programs. As of this Fall, that includes Service-Learning at Northeastern. 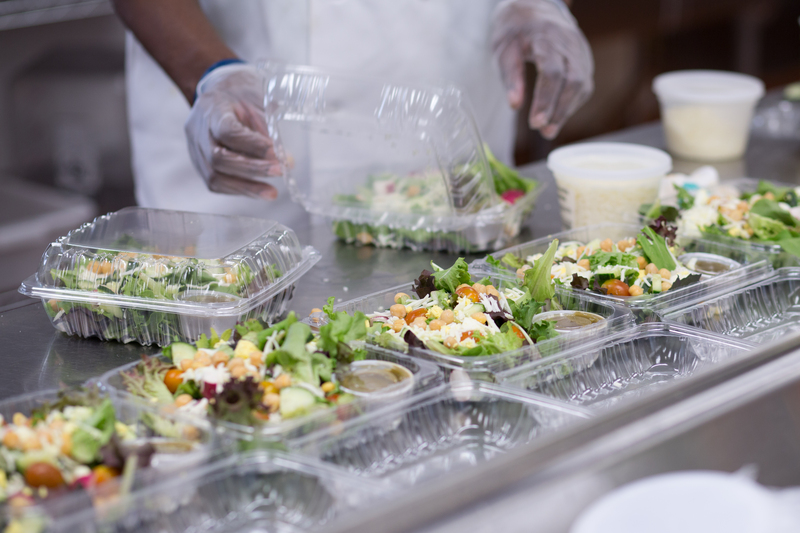 The recipe for Daily Table is simple: combine donations of fresh, delicious food with dedicated volunteers, to serve up affordable groceries and meals to a neighborhood where healthy food is hard to come by. It’s a recipe for success. Founded by former Trader Joe’s president Doug Rauch, Daily Table opened its doors in June 2015 and has been satisfying Dorchester residents ever since. The not-for-profit retail store pairs a community’s need with a very sustainable solution. 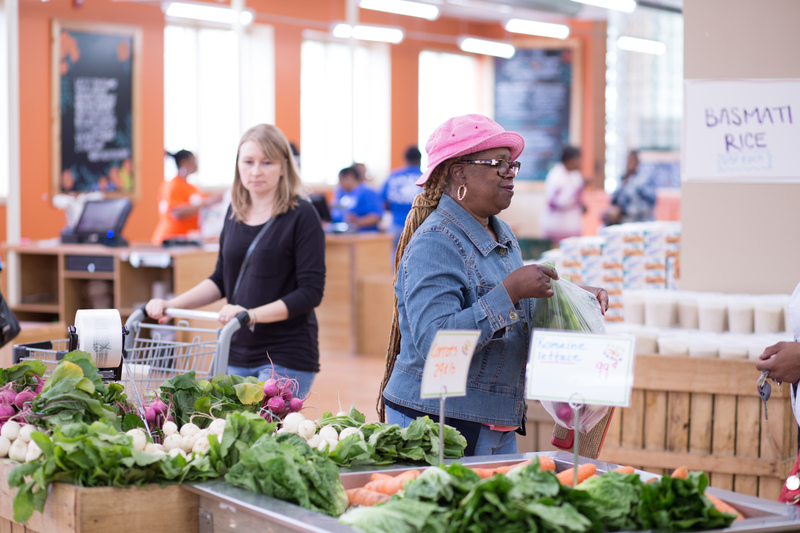 “It was an idea that came out of this problem of surplus, excess food that was going to waste and wanting to be able to sell that food in a neighborhood where healthy food is hard to come by,” Nielsen said. The contents of the Daily Table shelves change based on the food that is “recovered,” as the organization states on its website, on any given day, but customers can expect to find entrees, soups, stews, sandwiches, milk, bread and a variety of fruits and vegetables. The organization is able to offer all of its food items at affordable prices thanks to its network of partners from different stages of food production. “We have a number of different partners that we’re so glad to have,” Nielsen said, referring to growers, suppliers, manufacturers, and supermarkets. She explained that some of the organizations that Daily Table partners with gleans excess, post-harvest produce that is perfectly fine to sell. “It’s more cost effective sometimes just to throw it away,” Nielsen said, explaining why some surplus or near-expiring food might not ever make it to grocery store shelves. The organization emphasizes on its website that the food they sell is fresh and safe to eat, and details the common myths behind “sell by” and “best by” dates. For Daily Table consumers, this means that they can purchase perfectly edible, healthy food at low cost. In addition to its partners and donations, Daily Table also relies on its community of volunteers. “Our volunteer program is so integral to the mission,” Nielsen said. Current volunteers join Daily Table “from all over the place,” Nielsen said, including, as of this Fall, Service-Learning at Northeastern. Daily Table is currently partnered with Kim Irmiter’s Connections & Decisions course for first-year, undeclared students. Students serving with the organization are traveling weekly to Dorchester to help with food preparation and sorting through donations. Rachel Vallée, a Connections & Decisions student, had her sights set on Daily Table as her community partner largely because of the organization’s mission. “They provide healthy food at affordable prices, so that families are able to eat wholesome food and also feel pride in being able to still purchase their own groceries,” Vallée said. So far at Daily Table, Vallée has helped to sort through and peel bananas, “putting the ones that were in good condition in freezer bags in order to be used to make smoothies,” which she says are a big hit at the store. “My second shift I packaged meals of chili and rice, weighing out portions and sealing them to be sold in the store,” Vallée said. Oona Kernan, a peer of Vallée’s who is also serving at Daily Table, said that she’s enjoyed getting to know and working with other volunteers and Daily Table staff during her service. Vallée agreed, saying that the staff has made her feel right at home. “It’s obvious that the other employees and volunteers really want to … create a comfortable environment,” she said. “Even just in the two weeks I have been there I have met such kind and hardworking people, and it’s very entertaining to watch them sing and dance in the kitchen as often as they do,” Vallée added. Nielsen, too, commented on the atmosphere at the organization, saying that the volunteers have only added to it. More than an enjoyable Friday afternoon, Vallée also said she is gaining valuable experience through her service that ties to her course’s learning objectives, specific to undeclared students. “Doing Service-Learning at Daily Table has helped remind me of some things that I really enjoy doing and the type of community I enjoy being a part of,” Kernan said. Just as the partnership between Daily Table and Service-Learning at Northeastern is in its infancy, so too is the now sixth-month-old storefront. “I think it will be interesting to see how the organization develops and figures out what works and what doesn’t work throughout the course of the semester,” Vallée said. The organization plans to open a few additional locations in Boston, with its Dorchester storefront acting as the hub. “Fortunately, or unfortunately, there are many places where this is a problem,” Nielsen said in reference to neighborhoods lacking healthy, affordable food. Opening more locations will help to answer this problem in additional communities, but will also provide jobs for various neighborhood natives. Nielsen, herself, has worked in Daily Table’s Dorchester neighborhood since high school, and she takes pride in the fact that the organization hires from the community. “That’s something that’s very important to me,” she said. Daily Table takes insight from its Community Advisory Council, consisting of individuals who were leaders of nonprofits in the community, and in doing so they are able to make meaningful decisions that reflect and are dictated by the community’s needs. So far, they seemed to have found some success as their consumers are expressing a measurable impact on their lives. Introducing the Service-Learning Street Team!